ON the frontline stretching from Kentish Town through Chalk Farm to Mornington Crescent, zero-hour is 4pm and the average age of the combatants is 16. 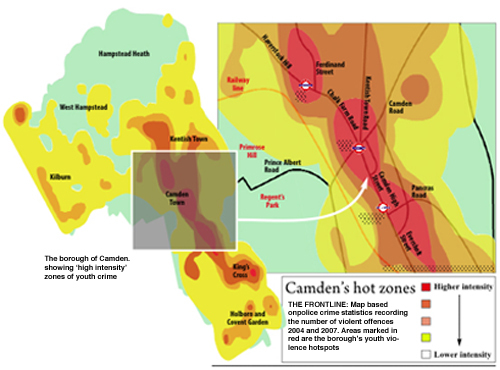 New crime mapping compiled by Camden police shows a “high intensity” zone that follows Camden High Street into Chalk Farm Road and north up Ferdinand Street to Malden Road. Within it, the average age of the victims of reported youth violence – everything from harassment to murder – is just 18. A breakdown of the timing of attacks on the young shows that the streets across Camden are at their most dangerous not in the dark of night, but in the bustle of the hometime hour, with the peak of the violence occurring at 4pm. A thousand violent crimes a year are reported against the under-20s – and that doesn’t include robberies or the many hundreds of assaults where the victim never complains. Yet Camden still has lower rates of youth crime than much of London. According to some measurements, it is falling – along with violent crime across all age groups. Last night (Wednesday), a gathering of community leaders met the borough’s top police officers at the Town Hall to discuss crime among the youth – joined by a delegation of teenagers from Castlehaven and Queen’s Crescent youth clubs. The conversation about gangs and violence in Camden has become far franker in the last year. A new regime at Camden’s police headquarters recognised the problems well ahead of the current, media-led obsession with youth crime and stopped pretending either that there was no problem, or that they had all the answers. Last night, acting Superintendent Paul Morris was typically open. He defied taboo by naming some of Camden’s so-called gangs – the Silent Movers, the Centric Crew, the ANC, Camden Militants, the TMS – and outlined the challenges the police face: a lack of willingness to take responsibility on the part of parents who refuse to believe their children are in trouble, communities who seek to deflect the blame and an escalation in the levels of “acceptable violence”. He also highlighted what he called the “fearlessness” of offenders, pointing out that of the 20 murders of young people in London this year, there have been arrests in every case. But to stem the fear among, or perhaps of, the young there has been a massive increase in enforcement measures- and especially stop and search of teenagers. And as the young people at the meeting made clear, this places strains on an already uneasy relationship between the authorities and the young. Others spoke anonymously, or through their youth workers: “What he is saying is the police seem to be stopping and searching for no reason,” said one; “The only time people should be stopped and searched is when they’re in big groups and a fighting is starting or something,” said another. Their comments touched a chord. Chief Superintendent Dominic Clout, the borough’s commander, responded: “My officers have a job to do and it is about trying to prevent more kids getting stabbed, injured and murdered on our streets.